Now available around the globe! On 12 September 2006 22 of the international free-to-air satellite television services being received on Building 20 were switched from GrangeNet (the Government funded high performance research network that closes this year) to AARNet3 (The next generation of the AARNet network: see http://www.aarnet.edu.au/Content.aspx?p=19). AARNet3 was launched in Canberra on 15 September 2006. Only the international services received from satellites are included in the package, since the local free-to-air services that are reticulated around the campus network as well should not be distributed beyond the local area for regulatory reasons. Discussions are continuing with a number of experts to confirm previous advice on the legality of what we are doing. 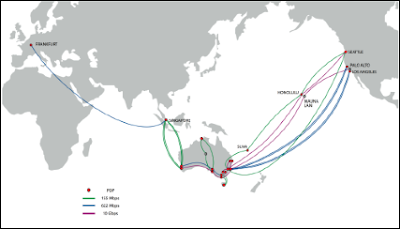 With appropriate configurations at the various nodes where the internet traffic is routed, services can now be viewed live in Universities and research institutions connected to AARNet3 from Brisbane to Perth, many points in-between, and beyond. There is no charge for the traffic because AARNet does not charge for ‘on-net’ (AARNet) traffic.